The launch featured a curated pizza-making workshop delivered by Slow Food Hobart, with Jo Cook and MONA executive chef Philippe Leban giving expert advice on how to prepare the perfect pizza, as well as some tips on how to find ripe vegetables in amongst the abundant Bridgewater Community Centre garden. Students were also treated to a special visit from North Melbourne Football Club players Andrew Swallow, Mason Wood and Will Fordham as part of North Melbourne Football Club’s community engagement program. 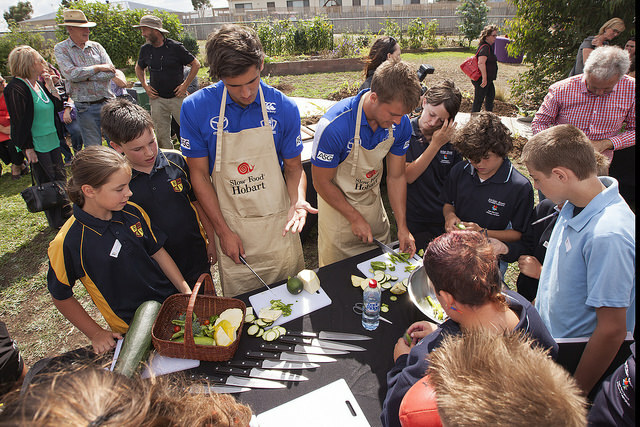 The students rubbed shoulders with the football players and as they chopped zucchinis and other vegetables from the garden, spoke about healthy eating and ate their finished product – veggie pizzas. Members from the Bridgewater community, and Community Blitz volunteers were also on hand. Students from Jordan River Learning Federation schools Gagebrook Primary, Herdsmans Cove, East Derwent Primary and Risdon Vale Primary school were in attendance .